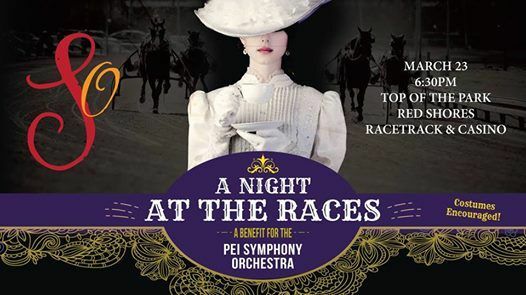 Join us at Red Shores Race Track on March 23rd as we recapture the adventure of Eliza Doolittle's Ascot debut, the excitement of Derby Day in Kentucky, the glamour of Cary Grant flirting with Claudette Colbert in the enclosure at Hialeah, and maybe even a touch of the Marx Brothers with 'A Night at the Races'. 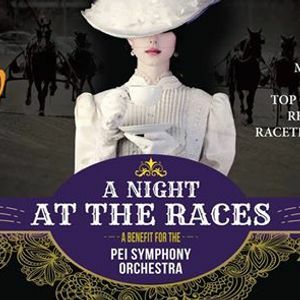 It promises to be an evening of fine food, great entertainment, a chance to win at the track and the opportunity to support our Island's symphony orchestra. There will be the Top of the Park buffet dinner, a cash bar, entertainment by Singing Strings, betting on the race of the day and a silent auction. Cocktails and reception at 6:30pm, dinner at 7:00pm. Tara MacLean will serve as master of ceremonies, and will treat the audience to a few musical selections throughout the evening as well. Tara MacLean is an award winning singer, songwriter and recording artist. She has toured the world singing her songs for over 20 years and has returned to her home on Prince Edward Island to present her show- Atlantic Blue, that will be playing this summer with The Charlottetown Festival. Tara has also recorded a new album of original material set for release July 2019. Tara is thrilled to be Master of Ceremonies for the PEI Symphony Orchestra's Annual Dinner. The PEISO presents A Night At The Races!